Thomas William Courtney was born August 17, 1933 in Newark. His father was a pitcher in the Yankees minor league system, playing for the Newark Bears. He quit baseball soon after Tom was born and the family moved to Livingston. Tom followed in his father’s footsteps and became a baseball pitcher as a teenager. He had a good fastball but poor control, so he quit playing after a couple of seasons at Caldwell High School. Looking for a spring sport, Tom was drawn to tennis at first, but the Chiefs basketball coach, Dwight Burr, convinced him to go out for track. Coach Emil Piel asked him to try the half mile. He beat everyone on the team. Early in his track career, tom was knocked down and spiked by opposing runners. His father told him to race from the front of the pack, and after that he was tough to beat. As a senior in 1951 he was undefeated, and ran a 2:02 half mile. Tom was recruited by several colleges, including Penn, Yale and Villanova. He decided to go to Fordham, which offered him a full ride. Also, his mother’s cousin had been the captain of the Rams’ track team. Coach Artie O’Connor turned Tom into a world-class 400 and 800 meters runner. He was the NCAA 880 yard champion in 1955. After graduation, he was the 1956 AAU champion in the 400 meters and made the U.S. Olympic team, setting a new American record of 1.46 in the 800 meters. In the 800 meter final in Melbourne, Tom ran the race of his life against U.S. teammate Arnie Sowell and England’s Derek Johnson. Sowell, the world record holder, set a fast pace and Tom struggled to keep up. Sowell burned out with 40 meters to go and Tom passed him, but he was spent too. Johnson blew past both of them and appeared to have the race won, but Tom dug down deep and caught Johnson at the tape to win the gold medal. He later said that he had never run so hard; even his fingertips hurt. It took Tom an hour to stand after the race and get to the medal stand. Tom had hoped to compete in the 400 meters but he was too tired to run. He did compete as a member of the American 4x400 relay team. He ran the third leg in qualifying and the anchor leg in the final. Tom turned a slim lead into a blowout victory for his second gold medal. Tom continued competing for several years. He was the AUU champion in the 880 in 1957 and 1958, and set a world record of 1:46.8 in 1957. He also broke the world indoor record in the 880 three times in 1957. 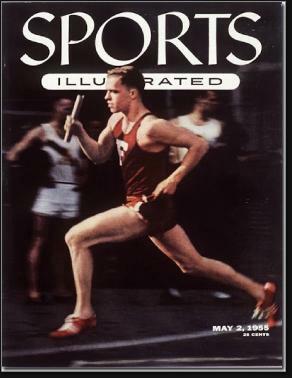 In 1958, Tom came with 0.1 second of breaking the world record in the 800 meters. By 1960, Tom was working in the financial industry and was married to his wife, Posy. He ran funds for Oppenheimer and PIMCO before retiring to Florida in 2011.